"With These Hands, I Give You My Heart and Crown it With My Love"
This age-old Irish saying is embodied in the Irish tradition of the Claddagh. The Claddagh, featured in this collection of sterling silver Irish jewelry, is a symbol of love, loyalty, and friendship. The namesake of an old Irish fishing village, the Claddagh is steeped in Irish lore. According to legend, a young man from this village was captured and sold, separating him from his true love. He collected tiny scraps of gold until, after many years, he was able to fashion a gold ring with hands, heart, and a crown for his love. When he eventually returned to the village of Claddagh, he reunited with his love and presented her with the ring he had made. Today, Claddagh jewelry remains an enduring symbol of love, loyalty, and friendship as well as fashion jewelry. 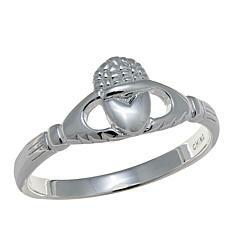 Irish tradition is for mothers to hand Claddagh jewelry down to their daughters. Choosing engravable sterling silver Irish jewelry enables you to give this special gift a personalized touch. Surprise your loved one with a wedding present, or celebrate your anniversary. Recognize that especially loyal friend who has blessed your life.